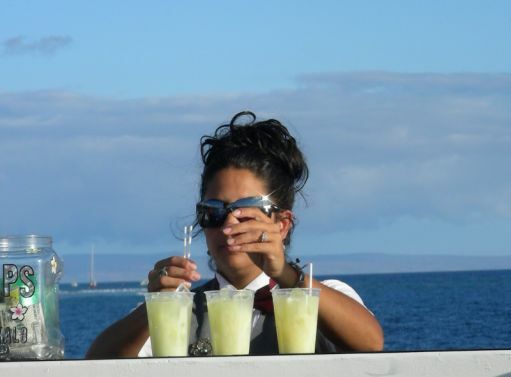 Celebrate the 4th of July on Maui with a Lahaina Sunset Dinner Cruise and Fireworks Show. 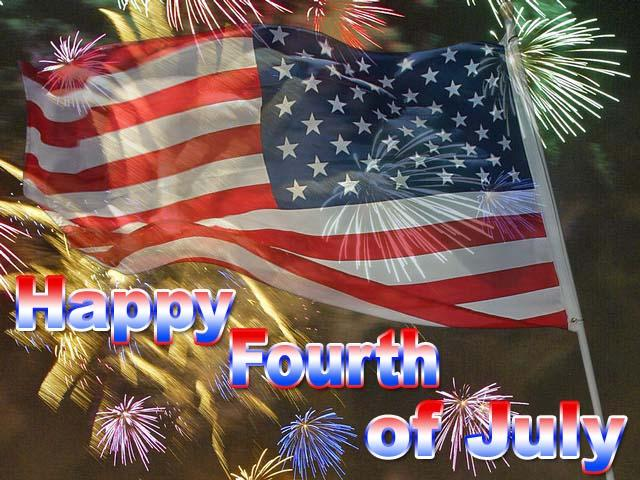 Reserve your scrumptious dinner cruise on the 4th of July and see the fireworks from the water! What a fun evening, good music, delicious food, great drinks, and the spectacular Fireworks Show! This 4th of July in Hawaii, celebrate and watch the Lahaina Fireworks on a fun Sunset Dinner Cruise that includes dancing under the stars. Book early as all 4th of July Fireworks dinner cruises will sell out months in advance, especially this one as all seats are on the top deck. 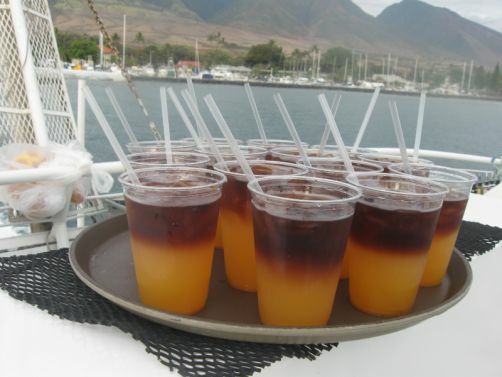 Once on board, you will be served a Hawaiian Maitai and 3 drinks are included in your ticket price. You may purchase adult beverages after that for $3-6 each. 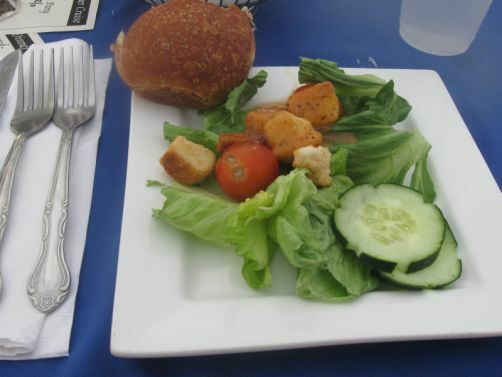 Plated dinner choices include prime rib, fresh island fish in a macadamia nut crust or a boneless half roasted chicken with a tropical guava glaze. After dinner, enjoy live music and dancing before and after the 4th of July fireworks show. You definitely will have an excellent evening on this 4th of July cruise. The night sky full of the spectacular fireworks will make for an extra special evening. When booking this activity be sure and let us know if you want the chicken, prime rib, island fish – macadamia nut crusted Mahi Mahi fillet or a vegetarian meal. 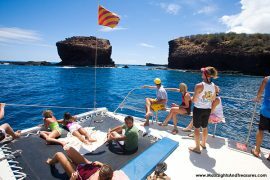 Staff Note: The Maui Princess is Maui’s largest and most stable boat at 120 ft. long. All seats are located on the upper deck of this 2 story vessel and have panoramic views. 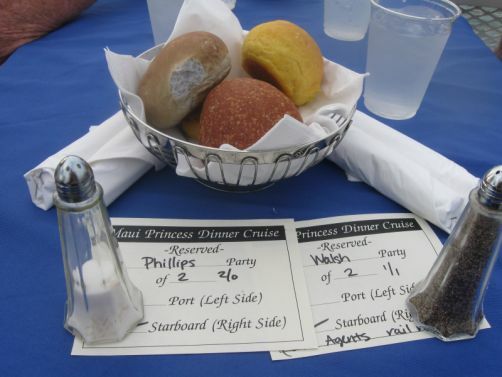 For those who may need assistance, there is also dining available on the first deck of the boat, which can be arranged in advance. The Maui Princess is a family-friendly dinner cruise for the 4th of July Independence Day Fireworks. Bring your ID if you plan on having an alcoholic beverage. Also bring a light sweater for after the sunset and don’t forget your camera. 12 oz. cut prime rib, one half roasted chicken, macadamia nut crusted mahi mahi fillet or a vegetarian meal…. Enjoy 3 complimentary alcoholic beverages- after those drinks, beer and wine are sold at $3.00 and mixed drinks at $4.00 You must be 21 years of age or older to drink alcoholic beverages. Id’s are required. All soft drinks are included with your meal. Gratuitiy is not included in the above prices.